"In The Glittering Illusion best-selling autobiographer Sheldon Vanauken reveals that he is also an historian of skill and creative insight. His thesis in this volume is both original and controversial--that the overwhelming inclination of the English during the Great Conflict between North and South was to enter the War on the side of the Confederacy. Indeed, he demonstrates with convincing evidence the dominance of such a sentiment, despite some contrary activity on the part of anti-slavery forces. "Why, then, didn't England make such a fateful commitment and insure the victory of the Southern forces? 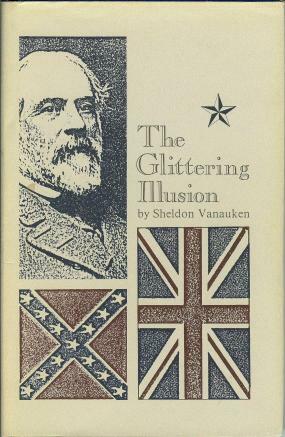 Vanauken argues that the answer to that question lies in a single 'glittering illusion' that hypnotized those that might otherwise have acted--the idea that Robert E. Lee, the enormously successful commander of the Southern forces was all but invincible, that with so brilliant a strategist in the field there was no need for England to commit its own considerable resources. "You are quite correct in saying that 1776 doesn't justify the 1861 secessions because 1776 itself needs justification. But I was saying only that Lincoln and company could not logically say that '76 was right and '61 was wrong."